Transliteration is the practice of transcribing a word or text written in one writing system into another writing system or system of rules for such practice. So you may have guessed what we are talking about. 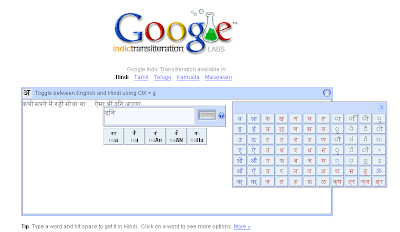 Actually what we are talking about is that Google transliterations have added translations (to be more precise Transliterations) into many Indian Languages like Hindi, Tamil, Telugu, Kannada and Malayalam. So you can now type in Hindi as you wish. The Feature was Already active on Blogger and Orkut but now is out in the open. This is Different than a translation because it actually does not translates into Hindi but actually to convert into Hindi you will have to write that Hindi text in English. So in order to write 'नमस्ते' you will have to type 'Namaste' to convert. Below is a snapshot of what you will get to see there. The transliteration is quite simple for basic words but as the words get complex the conversion becomes hazy. but there is nothing to worry as you can manually edit the words and the system learns as it is being used. so more the use the better it gets. So what we have seen is just another major India Specific web Development, after You Tube India and iPhone Coming to India, in recent times. I have made an attempt to transliteration mashup at http://padmanijain.googlepages.com/. Please send your comments. Hi Vineet, welcome. I checked your links but I was not able to find any transliteration mashup therein. All I found out was a You tube mashup, which was pretty nice.